Due to the special form of the profile chain, a larger contact is achieved between the bearing surfaces of the links (see diagram). This, in turn, reduces the surface pressure on the chain and consequently reduces wear substantially. This is a real advantage in abrasive environments. The new profile of the G120 chain has up to 38% higher moment of resistance compared to regular round-link chains with the same diameter. Therefore, chain can withstand bending forces better than round-link chains and is well equipped for heavy applications. Same dimension of chain and workload, G120 offers a design factor of 6:1 compared to G80 with 4:1. G120 has a powder coated finish in blue, which provides easy identification and corrosion protection. 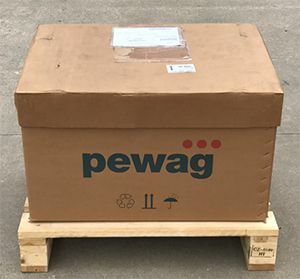 All of our Pewag Grade 120 Chain is Made in the Europe. 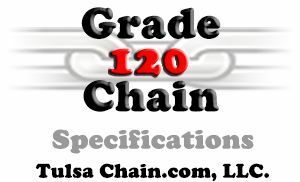 To help identify the grade and manufacturer all of our Grade 120 Chain is embossed with”120” and D16. The D16 is the chain manufacturer Pewag. The 120 identifies this as a Grade 120 Chain. Grade120 chain is typically finished with a Blue Powder Coat.. This is a tough durable finish. Grade 120 chain is a “square” link design. Intelligent profile - because of the intelligent use of material, the major characteristics of the chain (i.e. fatigue resistance and bending resistance) were improved in a remarkable way, when you compare the same cross section of the profile chain versus the round steel chain. In order to reach the best mechanical performance, the material use was optimized on effective areas (blue area) and reduced on less relevant areas (red area). the same cross section. Therefore the max stress in the chain is reduced (no red areas). 50% higher load capacity compared To Grade 80, 20% higher load capacity compared to G100. Pewag Grade 120 chain is 100% European made produced from the highest quality alloy steel available. The chain is tested throughout the manufacturing process. All of our Grade 120 chain is Proof Tested to twice the working load limit. The minimum break strength is four times the working load limit. Our Pewag Grade 120 Alloy Chain meets or exceeds all existing OSHA, Government and ASTM specification requirements. All of our Grade 120 Chain is 100 percent Proof Tested. Certs available free of charge. Please request at the time of order placement. Working Load Limit (WLL): (rated capacity) Is the maximum working load that should be applied In direct tension to an undamaged straight length of chain. Proof Test: (manufacturing test force) Is a term designating the minimum tensile force which has been applied to a chain under a constantly increasing force In direct tension during the manufacturing process. These loads are manufacturing integrity tests and shall not be used as criteria for service or design purpose. Minimum Breaking Force: The minimum force at which the chain during manufacture has been found by testing to break when a constantly increasing force is applied in direct tension. Breaking force values are not guarantees that all chain segments will endure these loads. This test is a manufacturer's attribute acceptance test and SHALL NOT be used as criteria for service and design purpose. Overhead Lifting: The process of lifting that would elevate a freely suspended load to such a position that dropping a load would present a possibility of bodily injury or Property damage.